Traumatized as a child, she witnessed her father committing suicide after killing her mother. Ever since then, she wandered through the streets, settling in an abandoned chapel with cats. 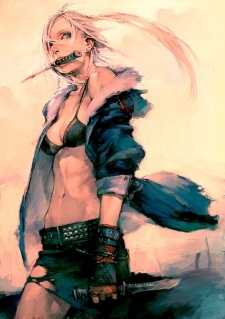 CIA discovered her and brought her in; with the purpose of making her a test subject for a certain project called SFP, ultimately forcing her to be trained in the art of killing. After a primary lack of awareness after being brought in she was then raped by 3 officers from the program. She escaped the labs and decided to hunt down and kill those 3 rapists. With revenge and mystery on her blood, this unpropitious cat-eyed girl is now working as a Confidential Assassination Trooper or C.A.T.